Affectionately described by a former Rector as "pound for pound, the best choir in the diocese," the St. Barnabas' Adult Choir leads the musical portions of the liturgy at the later, 10:45 a.m., Sunday services and at many special services throughout the program year. Currently consisting of fifteen to twenty amateur singers from a variety of backgrounds, the choir rehearses every Sunday at 9:00 a.m. The choir is not an audition group, though musical standards are fairly high. Some musical experience is a plus, but new singers will find the rehearsals a great learning experience. We have fun in those rehearsals, too, but are serious about the role we play in St. Barnabas' Parish's worship life. 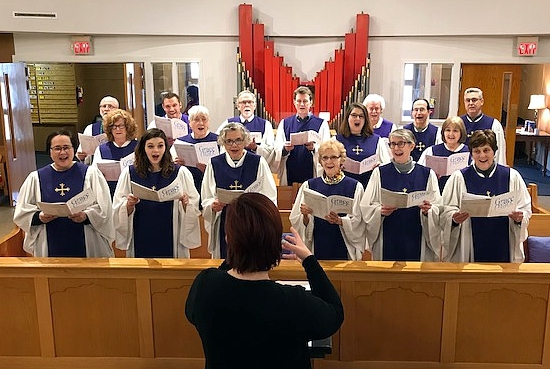 The musical style of the choir is eclectic, with music to suit a range of tastes: often classical or contemporary anthems, with the occasional rock or gospel piece thrown in to provide variety. We usually sing with organ or piano accompaniment, with occasional a capella singing, and brass or other instruments for the very special occasion. The choir is quite fortunate to have a talented professional musician leading it. Leah Milton, St. Barnabas' Director of Music, is a music educator in the Collinsville School District with experience leading both children's and adult choirs. When work and family obligations allow, Leah also performs with local community choruses and theater groups. 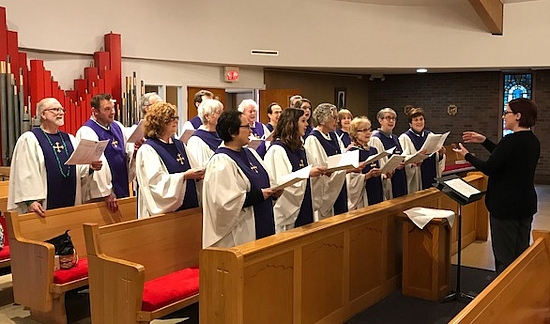 Parishioners wishing to "make a joyful noise" with the choir simply need to contact Leah to express their interest in joining and then show up for Sunday rehearsals. Posted below is the schedule for the second half of the 2018-2019 program year. Though pieces and dates are, as always, subject to change, we will try to follow this. Regular rehearsals are at 9:00 a.m. each Sunday morning. Remember that if you have not attended the rehearsal that morning, or the optional run-through after service the previous Sunday, you may not sing with the choir. Our part of the service is too important to leave to the uncertainties of sight-reading. If you are unable to be at a rehearsal and service, please contact Leah to let her know at lmilton@cusd.kahoks.org. You may download rehearsal music from the links that follow this schedule. Wednesday, March 6 - 6:15 p.m.
Choir members may download rehearsal recordings of most of the current repertoire, produced by Dave Palmer. These are .mp3 files that may be played in your browser, or downloaded and then copied to a tablet, phone, or .mp3 player, or burned to an audio CD for playback in CD players. To play in the browser, CLICK on the desired vocal part after the title. The file will download to a temporary location and play in your browser's media player in a new tab/window. If you have a PC, then RIGHT CLICK on the desired file and choose SAVE TARGET AS... to save it to your hard drive. If you have a Mac, then hold down the CONTROL KEY and then CLICK on the desired file and save it to your hard drive. Use your usual procedure to copy the file to your external player or to burn to an audio CD. Join us in making a joyful noise to the Lord!